listen)), is a state in the western region of India. It is the second most populous state after Uttar Pradesh and third largest state by area in India. Maharashtra is the wealthiest state in India, contributing 15% of the country's industrial output and 13.3% of its GDP (2006–2007 figures). Maharashtra is bordered by the Arabian Sea to the west, Gujarat and the Union territory of Dadra and Nagar Haveli to the northwest, Madhya Pradesh to the north and northeast, Chhattisgarh to the east, Karnataka to the south, Andhra Pradesh to the southeast and Goa to the southwest. The state covers an area of 307,731 km2 (118,816 sq mi) or 9.84% of the total geographical area of India. Mumbai, the capital city of the state, is India's largest city and the financial capital of the nation. Nagpur is the second (Winter) capital of the state. Marathi is the state's official language. Maharashtra is the world's second most populous first-level administrative country sub-division. Were it a nation in its own right, Maharashtra would be the world's tenth most populous country ahead of Mexico. In the 17th century, the Marathas rose under the leadership of Chhatrapati Shivaji Maharaj against the Mughals, who ruled a large part of India. By 1760, Maratha power had reached its zenith with a territory of over 250 million acres (1 million km²) or one-third of the Indian sub-continent. After the Third Anglo-Maratha War, the empire ended and most of Maharashtra became part of Bombay State under a British Raj. After Indian independence, Samyukta Maharashtra Samiti demanded unification of all Marathi-speaking regions under one state. At that time, Dr. Babasaheb Ambedkar was of the opinion that linguistic reorganization of states should be done on a "One state – One language" principle and not on a "One language – One state" principle. He submitted a memorandum to the reorganization commission stating that a "single government can not administer such a huge state as United Maharashtra". The first state reorganization committee created the current Maharashtra state on 1 May 1960 (known as Maharashtra Day). The Marathi-speaking areas of Bombay State, Deccan states and Vidarbha (which was part of Central Provinces and Berar) united, under the agreement known as Nagpur Pact, to form the current state. Maha ("great") + rashtra, derived from ratta, supposedly a corruption of Rashtrakuta (the name of a dynasty that held sway over the Deccan from the 8th to 10th centuries). Maha ("great") + Rathi or Ratha (charioteer). The word marathi is a corrupt pronunciation of the word "maharathi" who were an prolific warriors during times of Mahabharata. Along with maharathis, there were AtiRathis, atimaharathis,mahamaharathis. The Nashik Gazetteer states that in 246 BC Maharashtra is mentioned as one of the places to which Mauryan emperor Asoka sent an embassy, and Maharashtraka is recorded in a Chalukyan inscription of 580 CE as including three provinces and 99,000 villages. The name Maharashtra also appeared in a 7th century inscription and in the account of a Chinese traveler, Hiuen-Tsang. In 90 AD Vedishri, son of the Satavahana king Satakarni, the "Lord of Dakshinapatha, wielder of the unchecked wheel of Sovereignty", made Junnar, thirty miles north of Pune, the capital of his kingdom. It was also ruled by Kharavela, Western Satraps, Gupta Empire, Gurjara-Pratihara, Vakataka, Kadambas, Chalukya Empire, Rashtrakuta Dynasty, and Western Chalukya before Yadava rule. In the early 14th century the Yadava dynasty, which ruled most of present-day Maharashtra, was overthrown by the Delhi Sultanate ruler Ala-ud-din Khalji. Later, Muhammad bin Tughluq conquered parts of the Deccan, and temporarily shifted his capital from Delhi to Daulatabad in Maharashtra. After the collapse of the Tughlaqs in 1347, the local Bahmani Sultanate of Gulbarga took over, governing the region for the next 150 years. After the breakup of the Bahamani sultanate, in 1518, Maharashtra split into and was ruled by five Deccan Sultanates: namely Nizamshah of Ahmednagar, Adilshah of Bijapur, Qutubshah of Golkonda, Bidarshah of Bidar and Imadshah of Berar. These kingdoms often fought amongst each other. United, they decisively defeated the Vijayanagara Empire of the south in 1565. Also present area of Mumbai was ruled by Sultanate of Gujarat before capturing by Portugal in 1535 and Faruqi dynasty ruled Khandesh region between 1382 and 1601 before Mughal annexation. Malik Ambar was the regent of the Nizamshahi dynasty of Ahmednagar from 1607 to 1626. During this period he increased the strength and power of Murtaza Nizam Shah and raised a large army. Malik Ambar is said to be the one of proponent of guerrilla warfare in the Deccan region. Malik Ambar assisted Shah Jahan wrestle power in Delhi from his stepmother, Nur Jahan, who had ambitions of seating her son-in-law on the throne. By the early 17th century, Shahaji Bhosale, an ambitious local general in the service of the Mughals and Adil Shah of Bijapur, attempted to establish his independent rule. His son Shivaji succeeded in establishing Maratha Empire which was further expanded by Bhonsle of Nagpur, Gaekwad of Baroda, Holkar of Indore, Scindia of Gwalior and Peshwas (prime ministers). The Marathas defeated the Mughals, and conquered large territories in Northern and Central parts of the Indian subcontinent. After the defeat at the Third Battle of Panipat in 1761, the Maratha restored their supremacy and ruled central and north India including New Delhi till the end of the eighteenth century. The Third Anglo-Maratha war (1817–1818) led to the end of the Maratha Empire and East India Company ruled the country in 1819. The British governed the region as part of the Bombay Presidency, which spanned an area from Karachi in Pakistan to northern Deccan. A number of the Maratha states persisted as princely states, retaining autonomy in return for acknowledging British suzerainty. The largest princely states in the territory of present-day Maharashtra were Nagpur, Satara and Kolhapur; Satara was annexed to Bombay Presidency in 1848, and Nagpur was annexed in 1853 to become Nagpur Province, later part of the Central Provinces. Berar, which had been part of the Nizam of Hyderabad's kingdom, was occupied by the British in 1853 and annexed to the Central Provinces in 1903. However, a large part of present-day Maharashtra, called Marathwada, remained part of the Nizam's Hyderabad State throughout the British period. The British rule was marked by social reforms and an improvement in infrastructure as well as revolts due to their discriminatory policies. At the beginning of the 20th century, the struggle for independence took shape led by extremists like Bal Gangadhar Tilak and Vinayak Damodar Savarkar and the moderates like Justice Mahadev Govind Ranade, Gopal Krishna Gokhale, Pherozeshah Mehta and Dadabhai Nowrojee. In 1942, the Quit India Movement was called by Gandhi which was marked by a non-violent civil disobedience movement and strikes in the region. The ultimatum to the British to "Quit India" was given in Mumbai, and culminated in the transfer of power and the independence of India in 1947. BG Kher was the first Chief Minister of the tri-lingual Bombay Presidency. After India's independence in 1947, the princely states were integrated into the Union of India. In the case of Hyderabad this was done in 1948 using military force, in Operation Polo. After India's independence, the Deccan States, including Kolhapur were integrated into Bombay State, which was created from the former Bombay Presidency in 1950. In 1956, the States Reorganisation Act reorganized the Indian states along linguistic lines, and Bombay Presidency State was enlarged by the addition of the predominantly Marathi-speaking regions of Marathwada (Aurangabad Division) from erstwhile Hyderabad state and Vidarbha region from the Central Provinces and Berar. Also, southernmost part of Bombay State was ceded to Mysore one. From 1954–1955 the people of Maharashtra strongly protested against bilingual Bombay state and Samayukta Maharashtra Samiti was formed. Mahagujarat Movement was also started for separate Gujarat state. S.M. Joshi, S.A. Dange, P.K. Atre and other leaders fought for a separate state of Maharashtra with Mumbai as its capital. On 1 May 1960, following mass protests and sacrifice of 105 human lives the separate Marathi-speaking state was formed by dividing earlier Bombay state into new states of Maharashtra and Gujarat. The demand of the local people of merging some of the Marathi speaking areas of Karnataka namely Belgaum, Karwar and Nipani is still pending. Pune is located at the confluence of the Mula and Mutha rivers. Maharashtra encompasses an area of 308,000 km² (119,000 mi²), and is the third largest state in India. It is bordered by the states of Madhya Pradesh to the north, Chhattisgarh to the east, Andhra Pradesh to the southeast, Karnataka to the south, and Goa to the southwest. The state of Gujarat lies to the northwest, with the Union territory of Dadra and Nagar Haveli sandwiched in between. The Arabian Sea makes up Maharashtra's west coast. The Western Ghats better known as Sahyadri, are a hilly range running parallel to the coast, at an average elevation of 1,200 metres (4,000 ft). Kalsubai, a peak in the Sahyadris, near Nashik City is the highest elevated point in Maharashtra. To the west of these hills lie the Konkan coastal plains, 50–80 kilometres in width. To the east of the Ghats lies the flat Deccan Plateau. The Western Ghats form one of the three watersheds of India, from which many South Indian rivers originate, notable among them being Godavari River, and Krishna River, which flow eastward into the Bay of Bengal, forming one of the greatest river basins in India. Several wildlife sanctuaries, national parks and Project Tiger reserves have been created in Maharashtra, with the aim of conserving the rich bio-diversity of the region. As of May 2004, India has 92 national parks, of which six are located in Maharashtra.There are 4 project tiger areas in Maharashtra. viz Tadoba-Andhari, Melghat, Sahyadri and Pench. A large percentage of Maharashtra's forests and wildlife lie along the western Ghats or western Maharashtra and eastern Vidarbha. Navegaon National Park, located near Gondia in the eastern region of Vidarbha is home to birds, deer, bears and leopards. Nagzira wildlife sanctuary lies in Tirora Range of Bhandara Forest Division, in Gondia district of Vidarbha region. The sanctuary consists of a range of hills with small lakes within its boundary. These lakes guarantee a source of water to wildlife throughout the year, and heighten the beauty of the landscape. Tadoba Andhari Tiger Project, a prominent tiger reserve near Chandrapur in Vidarbha. It is 40 km away from Chandrapur. Pench National Park, in Nagpur district, extends into Madhya Pradesh as well. It has now been upgraded into a Tiger project. Chandoli National Park, located in Sangli district has a variety of flora and fauna. The Prachitgad Fort and Chandoli dam and scenic water falls can be found around the park. Gugamal National Park, also known as Melghat Tiger Reserve is located in Amravati district. It is 80 km away from Amravati. Sanjay Gandhi National Park, also known as Borivali National Park is located in Mumbai and is the world's largest national park within city limits. Sagareshwar Wildlife Sanctuary, a man made wildlife sanctuary situated 30 km from Sangli. Ancient temples of Lord Shiva and Jain Temple of Parshwanath located in Sagareshwar are an attraction. Maldhok Sanctuary, situated in Solapur district. Some of its part is in Ahmednagar district. The sanctuary is for the Great Indian Bustard. Tansa wildlife Sanctuary, situated in Thane district and along the Tansa and Vaitarna river. The major water supplying dams Tansa, Modaksagar and lower vaitarna are located in the Sanctuary. The fauna include Leopard, barking deer, Hyena, Flying squirrel and Wild boar. There are four forest ranges in the sanctuary-Tansa, Vaitarna, Khardi and Parli. The wildlife division head quarters is at Thane. Bhimashankar wildlife Sanctuary. This is situated in the western Ghats and is famous for the Malabar Giant squirrel. The sanctuary is located in Thane, Raigad and Pune district of Maharashtra. Apart from these, Maharashtra has 35 wildlife sanctuaries spread all over the state, listed here. Phansad Wildlife Sanctuary, and the Koyna Wildlife Sanctuary are the important ones. Apart from the above, Matheran, a Hill station near Mumbai has been declared an eco-sensitive zone (protected area) by the Government of India. Maharashtra has three of fifteen most important cities of India, Pune and Nagpur being the other two than the financial capital, Mumbai.Favourable economic policies in the 1970s led to Maharashtra becoming India's leading industrial state in the last quarter of 20th century. Over 41% of the S&P CNX 500 conglomerates have corporate offices in Maharashtra. Maharashtra's gross state domestic product for 2011 is at $224.12 billion. The state's debt is estimated to be about Expression error: Unrecognised punctuation character "["., i.e. about 17 percent of GDP. In 2012 Maharashtra reported a revenue surplus of Expression error: Unrecognised punctuation character "["., with a total revenue of Expression error: Unrecognised punctuation character "[". and a spending of Expression error: Unrecognised punctuation character "[".. Maharashtra is the most urbanised state with urban population of 42% of whole population. The headquarters to the Financial Planning Standards Board India is in Maharashtra. Maharashtra is India's leading industrial state contributing 15% of national industrial output and over 40% of India's national revenue. 64.14% of the people are employed in agriculture and allied activities. Almost 46% of the GSDP is contributed by industry. Major industries in Maharashtra include chemical and allied products, electrical and non-electrical machinery, textiles, petroleum and allied products. Other important industries include metal products, wine, jewellery, pharmaceuticals, engineering goods, machine tools, steel and iron castings and plastic wares. Food crops include mangoes, grapes, bananas, oranges, wheat, rice, jowar, bajra, and pulses. Cash crops include groundnut, cotton, sugarcane, turmeric, and tobacco. The net irrigated area totals 33,500 square kilometres. Mumbai, the capital of Maharashtra and the financial capital of India, houses the headquarters of all major banks, financial institutions, insurance companies, leading airlines in India. India's largest stock exchange Bombay Stock Exchange, the oldest in Asia, is also located in the city. Maharashtra has set up software parks in Pune, Navi Mumbai, Aurangabad, Nagpur and Nashik. Now Maharashtra is the second largest exporter of software products with annual exports of Expression error: Unrecognised punctuation character "[". and accounts for more than 30 per cent of the country's software exports, with over 1,200 software units based in the state. Jawaharlal Nehru Port Trust in Navi Mumbai is the busiest port in India. Chhatrapati Shivaji International Airport in Mumbai is the busiest airport in South Asia as per passenger volume. Pune is another city in Maharashtra which is considered among the top 10 cities in India. It is the education and IT hub of India. Pune is also called as 'Oxford of the east' for the quality of education provided by the University of Pune. The coast of Maharashtra has been a shipbuilding center for many centuries. Companies operating shipyards in the state include Bharati Shipyard at Ratnagiri and the Rajapur Shipyards at Rajapur, apart from the state owned Mazagon Dock Limited at Mumbai. Mumbai is home for the world's largest film industry- Bollywood, Hindi filmmaking industry. Maharashtra ranks first nationwide in coal-based thermal electricity as well as nuclear electricity generation with national market shares of over 13% and 17% respectively. Maharashtra is also introducing Jatropha cultivation and has started a project for the identification of suitable sites for Jatropha plantations. Ralegan Siddhi is a village in Ahmednagar District that is considered a model of environmental conservation. An international cargo hub (Multi-modal International Cargo Hub and Airport at Nagpur, MIHAN) is being developed at Nagpur. MIHAN will be used for handling heavy cargo coming from South-East Asia and Middle-East Asia. Project will also include Expression error: Unrecognised punctuation character "[". Special Economic Zone (SEZ) for information technology (IT) companies. This will be the biggest development project in India so far. Indian and foreign automobile makers in the area include Audi, Fiat, General Motors India, J. C. Bamford, Mahindra & Mahindra, Mercedes-Benz, Skoda Auto, Tata Motors and Volkswagen. Pune has become an IT hub with the presence of almost all IT leading companies including TCS, Wipro, Tech Mahindra, Honeywell, IBM, Infosys, Cognizant and Microsoft. Like all states in India, the nominal head of state is the governor, appointed by the Union Government. The Governor's post is largely ceremonial. The Chief Minister is the head of government and is vested with most of the executive powers. Maharashtra's legislature is bicameral, one of the few states in India to have a bicameral type. The Vidhan Sabha (Legislative Assembly) is the lower house consisting of directly elected members. The Chief Minister is chosen by the members of the Vidhan Sabha. The Vidhan Parishad (Legislative Council) is the upper house, whose members are indirectly voted through an electoral college. Maharashtra is allocated nineteen seats in the Rajya Sabha and forty-eight in the Lok Sabha, India's national parliament. The capital city Mumbai is home to the Vidhan Sabha – the state assembly and Mantralaya, the administrative offices of the government. The legislature convenes its budget and monsoon sessions in Mumbai, and the winter session in Nagpur, which was designated as the state's auxiliary capital. After India's independence, most of Maharashtra's political history was dominated by the Indian National Congress. Maharashtra became a bastion of the Congress party producing stalwarts such as Y.B. Chavan, one of its most prominent Chief Ministers. The party enjoyed near unchallenged dominance of the political landscape until 1995 when the right wing Shiv Sena and Bharatiya Janata Party (BJP) secured an overwhelming majority in the state to form a coalition. After a split in the Congress party, former chief minister Sharad Pawar formed the Nationalist Congress Party (NCP), but formed a coalition with the Congress to keep out the BJP-SS combine. The 2004 elections saw the NCP gaining the largest number of seats to become the state's largest party, eroding much of the Shiv Sena's base. Now new parties emerging in Maharashtra's politics specially Maharashtra Navnirman Sena (Marathi: महाराष्ट्र नवनिर्माण सेना) based regional political party operating on the motto of "Sons of the Soil" founded on 9 March 2006 in Mumbai by Raj Thackeray after he left the Shiv Sena . Mumbai is home to the Bombay High Court which has jurisdiction over the states of Maharashtra, Goa, and the Union Territories of Daman and Diu and Dadra and Nagar Haveli, with the benches being at Nagpur and Aurangabad in Maharashtra and Panaji, Goa. The Bar Council of Maharashtra and Goa enrolled approximately 90,000 advocates on its roll (2009 data). The Bar Council is represented by 25 elected members from the above territory; the Advocate General of each state is an ex-officio member of the Council. This Bar Council elects one representative to the Bar Council of India as its member and also elects a chairman for the council. The tenure of the entire Council is five years. Harish Salve has served as the Solicitor General of India. Ravindra M. Kadam was the Advocate General of Maharashtra till recently. Maharashtra has good human resource development infrastructure in terms of educational institutions—301 engineering/diploma colleges, 616 industrial training institutes and more than 24 universities with a turnout of 160,000 technocrats every year. It is home to institutions like Centre for Development of Advanced Computing (C-DAC) which developed India's supercomputer, Indian Institute of Technology, Mumbai, Visvesvaraya National Institute of Technology (VNIT), Veermata Jijabai Technological Institute (VJTI), Sardar Patel College of Engineering, University Department of Chemical Technology, Army Institute of Technology Pune (AIT), College of Engineering Pune (COEP), Vishwakarma Institute of Technology ( VIT, Pune ), Fergusson College, Pune, Government College of Engineering Aurangabad, Government College of Engineering Amravati, C.S.M.S.S Dental College of Aurangabad Government College of Engineering Karad, Walchand College of Engineering, Sangli (WCES), Shri Guru Gobind Singhji Institute of Engineering and Technology Nanded (SGGSIE&T), Laxminarayan Institute of Technology (LIT), Topiwala National Medical College & BYL Nair Charitable Hospital and top management institutions. 50,000 youth trained to take up self-employment ventures every year by the Maharashtra Centre for Entrepreneurship Development (MCED), Aurangabad. The literacy rate is well above the national average at 82.9%. University of Mumbai, one of the largest universities in the world in terms of the number of graduates. The Indian Institute of Technology (Mumbai), Veermata Jijabai Technological Institute (VJTI), and University Institute of Chemical Technology (UICT), which are India's premier engineering and technology schools, and SNDT Women's University are the other autonomous universities in Mumbai. Mumbai is home to Narsee Monjee Institute of Management Studies (NMIMS), National Institute of Industrial Engineering (NITIE), Jamnalal Bajaj Institute of Management Studies (JBIMS), S P Jain Institute of Management and Research, K J Somaiya Institute of Management Studies and Research (SIMSR) and several other management schools. Government Law College and Sydenham College, respectively the oldest law and commerce colleges in India, are based in Mumbai. The Sir J. J. School of Art is Mumbai's oldest art institution. College of Engineering Pune, established in 1854 is the third oldest college in Asia. Mumbai is home to two prominent research institutions: the Tata Institute of Fundamental Research (TIFR) and the Bhabha Atomic Research Centre (BARC). The BARC operates CIRUS, a 40 MW nuclear research reactor at their facility in Trombay. The University of Pune, the National Defence Academy, Film and Television Institute of India, National Film Archives, Armed Forces Medical College and National Chemical Laboratory were established in Pune after the independence of India. ILS Law College, established by the Indian Law Society is one of the top ten law schools in India. Established medical schools such as the Armed Forces Medical College and Byramjee Jeejeebhoy Medical College train students from all over Maharashtra and India and are amongst the top medical colleges in India. Military Nursing College (affiliated to the AFMC) ranks among the top nursing colleges in the world. The University of Nagpur, established in 1923, one of the oldest universities in India, manages more than 24 engineering colleges, 43 science colleges and many colleges in the Arts and Commerce faculties. Nagpur is the home for Visvesvaraya National Institute of Technology (VNIT) (also referred to as NIT, Nagpur, formerly known as Visvesvaraya Regional College of Engineering (VRCE), Nagpur) is one of the first six Regional Engineering Colleges established under the scheme sponsored by Government of India and the Maharashtra State Government and is one of the Institutes of National Importance. The geographical center of India lies at Nagpur, known as Zero Mile Stone. 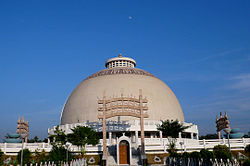 Nagpur is the headquarter for Hindu nationalist organisation Rashtriya Swayamsevak Sangh (RSS) and an important location for the Dalit Buddhist movement. Nagpur is also the home for National Fire Institution, Rashtrabhasha Prachar Samiti (promotion of and for spreading the national language, Hindi) and National Thermal Power Corporation (NTPC-Western zone). Maharashtra in total, has 50% India's Internet users and 45% of PC penetration in the country. Marathi is the official state language. In Mumbai and suburban areas, apart from the native Marathi and English, Gujarati is also spoken. In the northwest portion of Maharashtra, a dialect Ahirani is spoken by 2.5 million people. In south Konkan, a dialect known as Malvani is spoken by most of the people. In the Desh (inland) region of the Deccan, a dialect called Deshi is spoken , while in Vidarbha, a dialect known as Varhadi is spoken by most of the people. The Economic Survey of Maharashtra 2008–09 says the percentage of the state’s population that names Marathi as its mother tongue has declined to 68.8% from 76.5% over the past three decades. The total fertility rate in 2001 was 2.23. Hindus – 2.09, Muslims – 4.09, Christians – 1.41, Jains – 1.41, Sikh – 1.57, Buddhist – 2.24, others −2.25, Tribals – 3.14. In this state, 36.7% of children are underweight, 27.0% of the population is undernourished and 4.7% of children who die under the age of 5 die from hunger. Hindus form 83.2% of total population and Hinduism plays an important role in Maharashtrian people in their day-to-day life. Ganesh is the most popular deity amongst Marathi Hindus, followed by Krishna in the form of Vithal. They also worship the Shiva Family deities such as Shankar and Parvati. The Warkari tradition holds strong grip on local Hindus of Maharastra. The public Ganesh festival started by Lokmanya Tilak in the late 19th century is very popular. Marathi Hindus also revere Bhakti saints of all castes, such as Dnyaneshwar (Deshastha Brahmin), Savata Mali (Mali), Tukaram (Moray Maratahi-Kunbi), Namdev (Shimpi-Artsian, Vaishya) and Chokhamela (Mahar) and Banjara (Laman, Gormati),Rashtrasant Tukdoji Maharaj(Sant as well as Philosopher),Sant Gadge Maharaj(Sant as well as Philosopher). Islam is the second largest religion in the state with 15 million or (1.5 crore) adherents comprising 12 per cent of the population (as per 2001 census figures). Eid-ul-Fitr (Ramzan Eid) and Eid-ul-Azha (Bakra Eid) are the two important Muslim festivals in the state. Within Muslims, Sunnis represent an overwhelming majority. The Muslim population in the state is highly urbanised and is spread across different regions. Significant Muslim population can be found in Marathwada, Khandesh, and Mumbai-Thane belt. Vidarbha, Western Maharashtra and Konkan region also hold sizeable Muslim population. The urban character of the community in Maharashtra can be seen from the fact that Mumbai, the capital city of Maharashtra, has 18.5 per cent Muslims. Similarly, Nagpur the second capital of Maharashtra has 11 per cent Muslim population. In Aurangabad, Muslims form 39 per cent of the population. Muslims also form a majority in towns like Malegaon and Bhiwandi. Buddhism is the third largest religion in the state. Most Marathi Buddhists are followers of the Dalit Buddhist movement, a 19th and 20th-century Buddhist revival movement in India that received its most substantial impetus from Dr. B. R. Ambedkar who called for the conversion of Dalits to Buddhism to escape a caste-based society that considered them to be the lowest in the hierarchy. Buddhism accounts for nearly 6% in Maharastra's total population. Jainists are a major group in Maharashtra. Jain community census for 2001 in Maharashtra area was 1,301,843. Cultural roots on Maharashtra for Jainism explain this numbers, as this more than 2,500-year old religion has some ancient temples in Maharashtra. East Indians – Majority Catholics, concentrated in Mumbai and in the neighbouring districts of Thane and Raigad. St Bartholomew preached to the natives of this region in the 1st century AD. Marathi Christians – Majority Protestants found specially in Ahmednagar and Solapur. Protestantism was brought to these areas by American and Anglican missionaries during the 18th century. Marathi Christians have largely retained their pre-Christian cultural practices. Sikhism is India's fourth-largest religion and has existed for over 500 years, beginning with the birth of its founder Guru Nanak Dev ji. The Sikhs are predominantly located in Punjab, however the Sikh community has a sizeable presence in Maharashtra. Sikh community census for 2001 in Maharashtra was 215,337. Nanded, the second largest city in the Marathwada region (after Aurangabad) of Maharashtra, is an important holy place for the Sikh faith and is famous for the Hazur Sahib Gurudwara. Hazūr Sāhib ("presence of the master"), also spelled Hazoor Sahib, is one of the five takhts (seats of temporal authority) in Sikhism. Located on the banks of the River Godavari, it is where the 10th guru, Guru Gobind Singh Ji left human flesh. The Gurudwara within the complex is known Sach-Khand, "Realm of Truth". At a stone-throw distance from the Hazoor Sahib Gurudwara, there lies the Langar Sahib Gurudwara which is very famous for its grand Langar. In all teh city boasts of 13 major Gurudwaras with historic significance. There are two Zoroastrian communities in Maharahtra. Parsis, mainly found in Mumbai, have descended from a group of Iranian Zoroastrians who immigrated to Western India during 10th century AD, due to persecution by Muslims in Iran. Iranis, are comparatively recent arrivals, and represent the smaller of the two Indian-Zoroastrian communities. Their descendants culturally and linguistically closer to the Zoroastrians of Iran, in particular to the Zoroastrians of Yazd and Kerman. Consequently, the Dari dialect of the Zoroastrians of those provinces may also be heard amongst the Iranis. The Bene Israel ("Sons of Israel") are a strong community of Marathi Jews originally from villages in the Konkan region who migrated in the late 17th century to the nearby cities, primarily Mumbai, but also to Pune, and Ahmedabad. Prior to these waves of emigrations and to this day, the Bene Israel formed the largest sector of the subcontinent's Jewish population. The native language of the Bene Israel is Marathi and Hebrew. Most Bene Israel have now emigrated to Israel, Canada and other Commonwealth countries. Before the great migration after Indian Independence this community numbered at least 80,000. Aashadi Ekadashi is one of most important festivals celebrated across Maharashtra. It is also referred to as 'Wari' and people from all over Maharashtra, Karnataka and other parts of India walk to Pandharpur from their respective villages. Lord Ganesha's devotion is celebrated by Ganesh Chaturthi in August–September of every year. Town of Pen in Raigad district is famous for Ganesh Idols made of special Shadu Clay. Dagdusheth Halwai Ganpati, Lalbaugcha Raja, Shri Siddhivinayak Temple, Shri Ashtavinayaka's are the major holy places for Maharashtrians. Popular forms of God are Shiva, Krishna and Ganesha. Lord Shiva's devotion is celebrated by taking part in Maha Shivaratri (Great Night of Shiva) festival. In modern times, the Elephanta island in Mumbai, Lord's Shiva island in local mythology, originated the Elephant Festival. Lord Krishna's devotions are celebrated in the state-wide Gokul Ashtami (or Krishna Janmashtami, Krishna's birthday) whereby many devotees fast on the entire day until midnight. The Dahi-Handi is also observed on this day at many places. Lord Krishna's devotion are also celebrated at Kaartik Aamawasya (or Diwali) and at Narak Chaturdashi as the killing of the demon Narakasura. The other festivals celebrated on a large scale are Vijayadashami or Dasara (Marathi: दसरा), Navaratri, Holi, Diwali, Eid (Ramzan Eid). Simollanghan is a ritual performed on Dasara or Viajaya Dashami day in Maharashtra. Simollanghan is crossing the border or frontier of a village or a place. In ancient times, kings used to cross the frontier of their kingdom to fight against their rivals or neighbor kingdoms. They used to perform Ayudha Puja on Dasara and begin the war season. On Dasara, people cross the borders of their places (Seemollanghan) and collect the leaves of Apta tree (आपट्याची पाने) and exchange among their friends and relatives as gold (सोने म्हणून आपट्याची पाने देतात). People worship Shami tree and its leaves (शमीची पाने) on this day. Gopuram of a Pandharpur temple near Vithoba's central temple. Maharashtra has produced or been closely associated with many saints throughout its history. These have risen from all across the several castes. Some of the very revered examples of Bhakti saints are Dnyaneshwar, Eknath, Savta Mali, Tukaram, Namdev, Gora Kumbhar, Samarth Ramdas and Chokhamela. There have also been several other Harijan saints such as Sant Banka Mahar, Sant Bhagu, Sant Damaji panth, Sant Kanhopatra, Sant Karmamelam, Sant Nirmala, Sant Sadna, Sant Sakhubai, Sant Satyakam Jabali,and Sant Soyarabai, . It has also been the birthplace and home of world-reputed saints like Sai Baba of Shirdi, Gajanan Maharaj of shegaon, Swami Shukadas Maharaj, Swami Samarth Maharaj, and Meher Baba, whose tomb-shrine in Meherabad has become a place of world pilgrimage. Maharashtra is also equally famous for ardent devotees (or Bhaktas). For example, Namdev Mahar and his wife Bhagubai from Kharagpur are both devotees of Shirdi Sai Baba. The Sai Baba template in Shirdi is the second richest one in the country, a close second after the Lord Tirupati temples at Tirumala, Andhra Pradesh. Maharashtra is divided into six revenue divisions, which are further divided into thirty-five districts. These thirty-five districts are further divided into 109 sub-divisions of the districts and 357 Talukas in Maharashtra. The six administrative divisions in Maharashtra state are Amravati Division, Aurangabad Division, Konkan Division, Nagpur Division, Nashik Division, and Pune Division. Kokan – (Konkan Division) – (including, Mumbai City and Mumbai Suburban Area). Maharashtra has a border dispute with the neighbouring state of Karnataka over the district of Belgaum, Karwar and Nipani. Belgaum was incorporated into the newly formed Mysore state (now Karnataka) with the passage of the States Reorganisation Act (1956), which reorganised India's states along linguistic lines despite having about three-fourths of the total population speaking Marathi. Since then, Maharashtra has continued to claim the district. While the case is awaiting a verdict in the Supreme Court of India, the Government of Maharashtra wants the Central government to declare Belgaum and adjoining 865 villages as a Union Territory. Karnataka has rejected the move, insisting that Marathis in Karnataka were safe and lived in harmony. Mumbai, the Administrative Capital of Maharashtra, is also the financial capital city of India. Aurangabad is a tourist destination. Maharashtra has one of the highest level of urbanization of all Indian states. The mountainous topography and soil are not as suitable for intensive agriculture as the plains of North India; therefore, the proportion of the urban population (42.4 per cent) contrasts starkly with the national average of developing metros and many large towns. Mumbai is the state capital with a population of approximately 15.2 million people. The other large cities are Navi Mumbai, Thane, Pune, Nagpur, Nashik, Aurangabad, Solapur, Amravati, Kolhapur, Sangli and Nanded. Mumbai: Mumbai (including Thane and Navi Mumbai in its metropolitan area) is the financial and commercial capital of India and is the Administrative Capital of Maharashtra. It has the largest proportion of taxpayers in India and its share markets transact almost 70 per cent of the country’s stocks. It offers a lifestyle that is rich, cosmopolitan and diverse, with a variety of food, entertainment and nightlife. Chhatrapati Shivaji International Airport (CSIA) in Mumbai is the biggest and the second busiest airport in India. The new airport, the state of the art Navi Mumbai International Airport coming up at Panvel, Navi Mumbai will have all modern facilities. The city is India's link to the world of telecommunications and the Internet. VSNL (Now Tata Communications Limited) is the terminal point in India for all telephone and internet traffic. Mumbai is India's flagship port destination. It is also home to the Indian Navy's Western Command (INS). The film industry of India Bollywood is associated in Mumbai. Pune: Pune, the second largest city in Maharashtra and the seventh largest in India, is the state's cultural and heritage capital with a population of 4.5 million people. About 170 km from Mumbai by road, Pune was the bastion of the Maratha empire. Under the reign of the Peshwas, Pune blossomed into a centre of art and learning. Shaniwarwada, Saras baug, Aga Khan Palace, Parvati Temple, Khadakwasla Dam, Sinhgad are the most visited places by tourists in Pune. 'Ganeshotsav', a festival of Lord Ganesh is celebrated in Pune with lot of enthusiasm and worship. Pune is connected to Mumbai by the Mumbai-Pune Expressway. Pune also has very important military cantonments as well as the HQ of the Southern Command, the National Defence Academy, the Armed Forces Medical College, Pune, CME, and the Indian Air Force base at Lohegaon too. Pune is a major information technology hub of India as well as a foremost destination for automobile manufacturing and the component industry. Nagpur is the third largest city in Maharashtra and 13th largest in India. The erstwhile capital of the Nagpur Province since 1853 in British India, in 1861 it was made the capital of Central Province, in 1903 it was made capital of CP & Berar, in 1935 it was made capital of a provincial assembly with same name Central Provinces and Berar providing for an election by, Government of India Act, passed by British Parliament. After Independence of India, the “CP & Berar” was kept a separate entity with Nagpur as capital. In 1950 Nagpur became the capital of Madhya Pradesh. In 1956, Nagpur and the Marathi-speaking southern region Vidarbha was ceded to Bombay state. Nagpur was recommended as capital of Vidarbha state by Hon. Fazal Ali commission for reorganisation of states. Nagpur was described by the first Prime Minister of India Mr. Jawaharlal Nehru, as the "Heart of India" . Nagpur is the nerve centre of Vidarbha (eastern Maharashtra), Nagpur – the Orange City as it is known – is located in the centre of the country and is a geographical center of India, with a population of about 2.4 million people (2.1 million as per census 2001). It is the second administrative capital of Maharashtra. Nagpur is home of many industries, ranging from food products and chemicals to electrical and transports equipment. An international cargo airport, MIHAN is being builton the outskirts of the Nagpur city which will house number of service industries in its SEZ. The Maintenance Command of Indian Air Force is located in Nagpur. The "Zero Mile Stone" or the geographical center of India is located in Nagpur. Deekshabhoomi, Sitabardi Fort, Ambazari Lake, Seminary Hills, Ramtek Temple, Khindsi Lake, Pench National Park are some of the tourist attractions in and around Nagpur. Nashik is the fourth largest and third most industrialized city in the Maharashtra. One of the holy cities of the Hindu tradition, Nashik lies on the banks of the sacred river Godavari and has a population of about 1.8 million people. It is believed that Lord Rama, hero of the great Indian epic, the Ramayana, spent a major part of his exile here. Nashik hosts the Kumbhmela once every twelve years. Nashik is the wine capital of India with many vineyards thriving owing to the favorable climate for grapes. Nashik is dubbed the Napa Valley of India. Kolhapur It is the 6th most industrialised city in maharashtra. It is the "historical capital " of maharashtra .It is a princely state and one of the main cities during the prince Shivaji rule. The famous tourist attractions are the Mahalaxmi temple, Jyotiba Temple, Rankala lake, Shalini Palace, New Palace, Panhala fort and much more. About 3 million tourists visit kolhapur every year. The city is situated on the banks of river Panchganga and is known as 'Dakshin(south) Kashi'. It is also famous as "city of palaces & wrestlers".The coastal line (western) is only 75 km away from Kolhapur & hence is known as 'Door of Konkan'. Kolhapur is well known for its " sugar production ","kolhapuri saaj"(an ornament worn in traditional maharashtrian wedding), silver jewellery, jaggery, "kolhapuri chappals"(footwear),"kolhapuri pheta"(turban), "wrestling", kolhapuri masala (spices), cuisines mainly the non-vegetarian variety. Another field that Kolhapur prides itself of is films. In certain circles, Kolhapur was and is still considered the capital of the Marathi film industry. It has been credited as the place where Raja Harishchandra, the first feature film ever produced in India was conceptualised. It is not only famous as a tourist destination but also it is one of the most important places for "foundry businesses" in India. It also hosts "textile mega cluster " which is the largest in maharashtra & one of the largest in India .It has progressed to the status of a very important industrial city being the centre for sugar production, textiles, automobile and ancillaries, engineering and manufacturing, chemicals and dairy & milk industries in the region. Maharashtra has the largest road network in India at 267,452 kilometers. 17 National Highways connect Maharashtra to six neighbouring states. The length of National Highways in Maharashtra is 3688 kilometers. Maharashtra has a large state highway network. 97.5 per cent of the villages in the state were connected by all-weather roads as of March 2010. The Yeshwantrao Chavan Mumbai-Pune Expressway, the first access controlled toll road project in India was made fully operational in April 2002. The Maharashtra State Road Transport Corporation (MSRTC) has been providing passenger road transport service in the public sector since 1948, linking most of the towns and villages in and around the state with a large network of operation. These buses, popularly called ST (State Transport), are the preferred mode of transport for much of the populace. In addition to the government run buses, privately run luxury buses also ply between major towns. Other modes of public transport, such as a seven-seater tempo have gained popularity in semi-urban areas. The state is well-connected to other parts of the country with a railway network spanning 5,983 km between four Railways. The Konkan Railway, a subsidiary of the Indian Railways based in CBD Belapur, Navi Mumbai that serves the Konkan coastal region south of Mumbai and continues down the west coast of India. Maharashtra also has suburban railway networks that carry around 6.4 million passengers every day. The booming Indian economy, growing tourism industry, entry of low cost airlines, liberalization of international bi-lateral agreements and liberalization of civil aviation policy at the centre has resulted in an unprecedented growth in air traffic. Most of the State's airfields are operated by the Airports Authority of India (AAI) while Reliance Airport Developers (RADPL), currently operate five non – metro airports at Latur, Nanded, Baramati, Osmanabad and Yavatmal on a 95-year lease. The Maharashtra Airport Development Company Limited (MADC) that was set up by the Government in 2002 will take up development of Airports in the state that are not under the AAI or the Maharashtra Industrial Development Corporation (MIDC). MADC is playing the lead role in the planning and implementation of the Multi-modal International Cargo Hub and Airport at Nagpur (MIHAN) project. Nagpur's Dr. Babasaheb Ambedkar International Airport. Other city airports such as, Aurangabad and Nanded, are served by scheduled domestic services. Additionally, there are smaller airports like those at Akola, Amravati, Baramati, Chandrapur, Dhule, Gondia, Jalgaon, Karad, Kolhapur, Latur, Nashik, Osmanabad, Ratnagiri, Solapur and Yavatmal that do not have any scheduled air services. There are also private airstrips at Aamby Valley City and Shirpur. A Greenfield airport is being built by the MADC at Shirdi and another one by CIDCO at Navi Mumbai is being built for a whopping Expression error: Unrecognised punctuation character "["..
Maharashtra has three major ports at Mumbai (operated by the Mumbai Port Trust), the JNPT lying across the Mumbai harbour in Navi Mumbai, and in Ratnagiri, which handles the export of ores mined in the Maharastra hinterland. Additionally, there are 53 minor ports. Ferryboat services also operate at Mumbai, linking the city to neighbouring coastal towns. Minor ports in the state will be developed by the State government with the participation of the private sector under the Maharashtra Maritime Board. Seven minor ports are being developed in Phase-I. Kailash Temple in Ellora Caves. Marathi is the official language of Maharashtra. Maharashtrians take great pride in their language and history, particularly the Maratha Empire, its founder Chhatrapati Shivaji Maharaj is considered a folk hero across Maharashtra. About 60% of Maharashtrians are Hindu, and there are significant Muslim, Christian and Buddhist minorities. There are many temples in Maharashtra some of them being hundreds of years old. These temples are constructed in a fusion of architectural styles borrowed from North and South India. The temples also blend themes from Hindu, Buddhist and Jain cultures. A National Geographic edition reads, "The flow between faiths was such that for hundreds of years, almost all Buddhist temples, including the ones at Ajanta, were built under the rule and patronage of Hindu kings." The temple of Vitthal at Pandharpur is the most important temple for the Varkari sect. Other important religious places are the Ashtavinayaka temples of Lord Ganesha, Bhimashankar which is one of the Jyotirling (12 important Shiva temples). 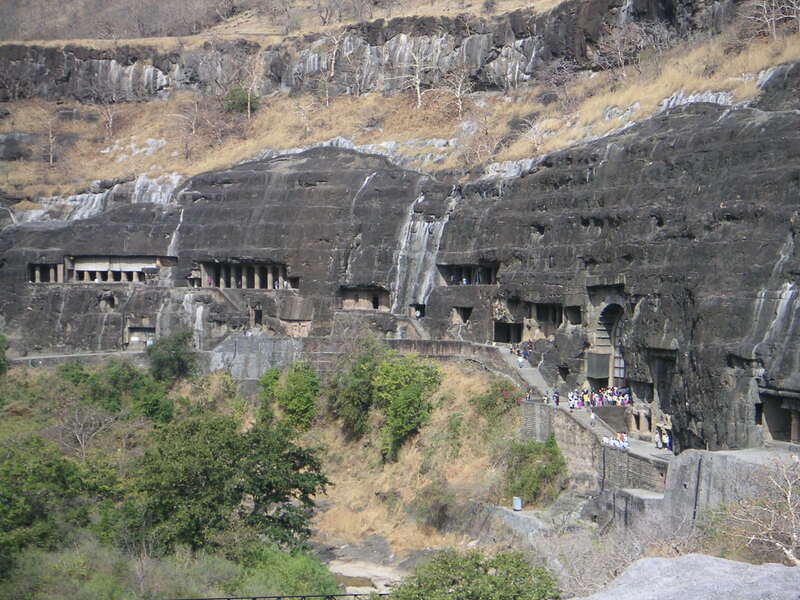 Ajanta and Ellora caves near Aurangabad as well as Elephanta Caves near Mumbai are UNESCO World Heritage Sites and famous tourist attractions. Mughal architecture can be seen is the tomb of the wife of Aurangzeb called Bibi Ka Maqbara located at Aurangabad. In 1708, the year following the death of Aurangzeb, Guru Gobind Singh the tenth spiritual leader of the Sikhs came over to Nanded, his permanent abode. He proclaimed himself the last living Guru and established the Guru Granth Sahib as the eternal Guru of the Sikhs. This elevates the reverence of Granth to that of a living Guru. A monument has been constructed at place where he breathed his last. Maharaja Ranjit Singh's endowment saw the construction of a beautiful Gurudwara at Nanded around 1835 AD. The Gurudwara features an imposing golden dome with intricate carvings and a breathtakingly beautiful artwork. It is known as Shri Huzur Abchalnagar Sachkhand Gurudwara. Maharashtra has a large number of hill, land and sea forts. Forts have played an important role in the history of Maharashtra since the time of the Peshwas. Some of the important forts in Maharashtra are Raigad, Vijaydurg, Sindhudurg, Pratapgad, Sinhagad. Majority of the forts in Maharashtra are found along the coastal region of Konkan. Maharashtra, like other states of India, has its own folk music. The folk music viz. Gondhal Lavani, Bharud and Powada are popular especially in rural areas, while the common forms of music from the Hindi and Marathi film industry are favoured in urban areas. The earliest instances of Marathi literature is by Sant Jnyaneshwar with his Bhawarthadeepika (popularly known as Jnyaneshwari). The compositions written during this period are spiritually inclined. The other compositions are by Sant Tukaram, Sant Namdev, and Sant Gora Kumbhar. The compositions are mostly in poetic form, which are called bhajans. These bhajans by saints are popular and part of day to day life. During same period of Chhatrapati Shivaji Maharaj, a great patriotic saint wandered in the soil of Maharashtra, Samarth Ramdas.He wrote many books such as Dasbodh, Atmaram, Manache shlok, and also enriched Marathi liturature by using almost all types of Vruttas like Karunashtake, sawaya, shatakas, ashtakas, manas, purvarambha, panchikarana etcThe modern Marathi literature has been enriched by famous poets and authors like P. L. Deshpande, Kusumagraj, Prahlad Keshav Atre and Vyankatesh Madgulkar. This literature has been passed on to the next generations through the medium of large numbers of books that are published every year in Marathi. The world famous film industry Bollywood is in Maharashtra, located in the economic capital of India, Mumbai. The Marathi film industry was once placed in Kolhapur but now is spread out through Mumbai too. The pioneer of Indian movie industry, Bharat Ratna Shri Dadasaheb Phalke, producer & director V. Shantaram, B.R. Chopra, Shakti Samanta, Raj Kapoor, form a few names of the Hindi film fraternity, while writer, director, and actor P. L. Deshpande, actor Ashok Saraf, actor Laxmikant Berde, actor & producer, Sachin Pilgaonkar, Mahesh Kothare belong to the Marathi film industry. Dada Kondke was the most popular name in Marathi film industry. The early period of Marathi theatre was dominated by playwrights like Kolhatkar, Khadilkar, Deval, Gadkari and Kirloskar who enriched the Marathi theatre for about half a century with excellent musical plays known as Sangeet Naatak. The genre of music used in such plays is known as Natyasangeet. It is during this era of the Marathi theatre that great singer-actors like Bal Gandharva, Keshavrao Bhosle, Bhaurao Kolhatkar and Deenanath Mangeshkar thrived. Some of the popular Marathi television news channels are IBN Lokmat, Star Majha, Zee Talkies, Zee Chovis Taas and entertainment channels areMi Marathi, DD Sahyadri, Zee Marathi, Zee Talkies, ETV Marathi, Star pravah and Saam TV which host shows ranging from soap operas, cooking and travel to political satire and game shows. The cuisine of Maharashtra varies according to the region of Maharashtra. The people of the Konkan region have a chiefly rice based diet with fish being a major component, due the close proximity to the sea. In eastern Maharashtra, the diet is based more on wheat, jowar and bajra. Puran Poli, Bakarwadi, plain simple Varan Bhat (a dish cooked with plain rice and curry), Modak and chivada are a few dishes to name. Chicken and mutton are also widely used for a variety of cuisines. Kolhapuri Mutton is a dish famous for its peculiar spicy nature. The cricket craze can be seen throughout Maharashtra, as it is the most widely followed and played sport. Kabaddi and hockey are also played with fervor. Children’s games include Viti-Dandu (Gilli-danda in Hindi) and Pakada-pakadi (tag). Hindus in Maharashtra follow the Shalivahana Saka era calendar. Gudi Padwa, Diwali, Rangapanchami, Gokulashtami and Ganeshotsav are some of the festivals that are celebrated in Maharashtra. Ganeshotsav is one of the biggest festival of Maharashtra which is celebrated with much reverence and festivity throughout the state and has since some time become popular all over the country. The festival which continues over ten days is in honour of Ganesha, the deva (like guardian angel ) of learning and knowledge under the one supreme lord . A large number of people walk hundreds of kilometers to Pandharpur for the annual pilgrimage in the month of Ashadh. ^ "census of india". Census of India, 2011. Government of India. 31 March 2011. http://www.censusindia.gov.in/2011-prov-results/prov_data_products.html/. Retrieved 6 April 2011. ^ "Trivia". Maharashtra Tourism. Government of Maharashtra. http://www.maharashtratourism.gov.in/MTDC/HTML/MaharashtraTourism/Trivia.html. Retrieved 2007-07-16. ^ Palkar, AB (2007). "Shri Bhaurao Dagadu Paralkar & Others V/s State of Maharashtra" (PDF). Report of One Man Commission Justice. p. 41. http://www.maharashtra.gov.in/pdf/VOLUME-I.pdf. Retrieved 2007-07-16. ^ "Countries". India: World Bank. http://www.worldbank.org.in/WBSITE/EXTERNAL/COUNTRIES/SOUTHASIAEXT/INDIAEXTN/0,,contentMDK:20951183~pagePK:141137~piPK:141127~theSitePK:295584,00.html. Retrieved 2008-10-31. ^ a b R.V. Russell. "The Tribes and Castes of the Central Provinces of India – Volume IV of IV". Gutenberg.org. http://www.gutenberg.org/files/20668/20668-h/20668-h.htm#d0e6680. Retrieved 2012-03-17. ^ Sir H. Risley’s India Census Report (1901), Ethnographic Appendices, p. 93. ^ "Maharashtra economy soars to $85b by 2005". Specials.rediff.com. 31 March 2009. http://specials.rediff.com/money/2009/mar/31slide13-indias-top-ten-debt-ridden-states.htm. Retrieved 2012-03-17. ^ "State Domestic Product of India 2011–12 | State-Wise GDP 2011 | District GDP of India | State-wise Population 2011 | VMW Analytic Services". Unidow.com. http://unidow.com/india%20home%20eng/statewise_gdp.html. Retrieved 2012-05-07. ^ "Heavy debt still weighs down Maharashtra". The Times of India. 24 March 2011. http://articles.timesofindia.indiatimes.com/2011-03-24/mumbai/29182257_1_debt-burden-white-paper-maharashtra. Retrieved 2012-05-07. ^ "Maharashtra govt tables R152.49-cr surplus budget". Financialexpress.com. 27 March 2012. http://www.financialexpress.com/news/maharashtra-govt-tables-r152.49cr-surplus-budget/928652/. Retrieved 2012-05-07. ^ "Maharashtra bifurcation will fetch additional Rs30,000 crore annually". dnaindia.com. http://www.dnaindia.com/mumbai/report_maharashtra-bifurcation-will-fetch-additional-rs30000-crore-annually_1338556. Retrieved 2010-01-28. ^ a b "Business Opportunities in Maharashtra Page 53". www.ibef.org. http://www.ibef.org/download/Maharashtra_060710.pdf. Retrieved 2010-07-27. 4,280 cr investment this fiscal". Business-standard.com. 17 May 2010. http://www.business-standard.com/india/news/mumbai-airport-plans-rs-2280-cr-investment-this-fiscal/94602/on. Retrieved 2010-07-16. ^ "Identification of suitable sites for Jatropha plantation in Maharashtra using remote sensing and GIS". University of Pune. Archived from the original on 27 March 2008. http://web.archive.org/web/20080327230241/http://www.unipune.ernet.in/dept/geography/vhdeosthali_files/jatropha.htm. Retrieved 2006-11-15. ^ "A model Indian village- Ralegaon Siddhi". http://edugreen.teri.res.in/explore/renew/rallegan.htm. Retrieved 2006-10-30. ^ "Maharashtra Airport Development Company Limited". www.madcindia.org. www.madcindia.org. Archived from the original on 10 May 2008. http://web.archive.org/web/20080510173353/http://www.madcindia.org/aboutmadc.htm. Retrieved 2008-05-14. ^ "Maharashtra Airport Development Company Limited". Press Information Bureau and Ministry of Civil Aviation. pib.nic.in. http://pib.nic.in/archieve/factsheet/2005/fscivil2005.pdf. Retrieved 2008-01-29. ^ "Nagpur stakes claim to lead boomtown pack". The Indian Express. http://www.indianexpress.com/story/3713.html. Retrieved 2006-06. ^ "Mihan is biggest development". timesofindia.indiatimes.com (timesofindia.indiatimes.com). 22 May 2007. http://timesofindia.indiatimes.com/Cities/Nagpur/Mihan_is_biggest_development_project/articleshow/2065727.cms. Retrieved 2007-05-22. ^ "MNS planting roots firmly in Mumbai with sons of the soil card - Worldnews.com". Article.wn.com. 22 February 2010. http://article.wn.com/view/2010/02/22/MNS_planting_roots_firmly_in_Mumbai_with_sons_of_the_soil_ca/. Retrieved 2010-07-16. ^ a b "Twelfth Finance Commission". Finance Commission of India. http://fincomindia.nic.in/. Retrieved 2006-09-19. 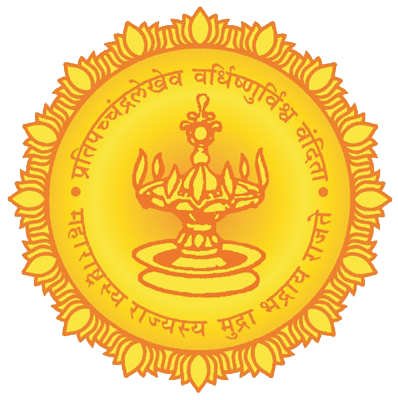 ^ "Universities of Maharashtra". Educationinfoindia.com. http://www.educationinfoindia.com/maharashtradir.htm. Retrieved 2010-07-16. ^ a b c "What makes Maharashtra unique?". Projectsmonitor.com. 1 May 1960. http://www.projectsmonitor.com/detailnews.asp?newsid=2076. Retrieved 2010-07-16. ^ "History". University of Mumbai. http://www.mu.ac.in/History.html. Retrieved 2009-06-09. ^ "IIT flights return home". Daily News and Analysis (DNA). 22 December 2006. http://www.dnaindia.com/report.asp?NewsID=1070723. Retrieved 2009-06-09. ^ "About the Institute". Veermata Jijabai Technological Institute (VJTI). http://www.vjti.ac.in/home_about.asp. Retrieved 2009-06-09. ^ "Admission process for autonomous engg colleges to start today". Indian Express Group. 11 June 2008. http://www.expressindia.com/latest-news/admission-process-for-autonomous-engg-colleges-to-start-today/321286/. Retrieved 2009-06-09. ^ "About University". SNDT Women's University. http://sndt.digitaluniversity.ac/Content.aspx?ID=7&ParentMenuID=7. Retrieved 2009-06-09. ^ Bansal, Rashmi (8 November 2004). "Is the 'IIM' brand invincible?". Rediff News (Rediff). http://nmims.edu/. Retrieved 2009-06-09. ^ "Sydenham College: Our Profile". Sydenham College. http://www.sydenham.edu/our_profile.html. Retrieved 2009-04-26. ^ "About The Government Law College". Government Law College. http://www.glc.edu/incept.asp. Retrieved 2009-04-26. ^ Martyris, Nina (6 October 2002). "JJ School seeks help from new friends". The Times of India. http://timesofindia.indiatimes.com/articleshow/24305727.cms. Retrieved 2009-05-13. ^ "University ties up with renowned institutes". Daily News and Analysis (DNA). 24 November 2006. http://www.dnaindia.com/report.asp?NewsID=1065998. Retrieved 2009-06-09. ^ "CIRUS reactor". Bhabha Atomic Research Centre (BARC). http://www.barc.ernet.in/webpages/reactors/cirus.html. Retrieved 2009-05-12. ^ "Is Maharashtra still numero uno? – Karnataka – Infrastructure Special – Express Computer India". Expresscomputeronline.com. 28 April 2003. http://www.expresscomputeronline.com/20030428/infra03.shtml. Retrieved 2010-09-28. ^ "Mahapopulation" (in Marathi) (PDF). Census of India. www.maharashtra.gov.in. http://www.maharashtra.gov.in/english/ecoSurvey/ataglanc.pdf. Retrieved 2008-06-04. ^ "Impact of Immigration". http://www.dnaindia.com/mumbai/report_marathi-population-in-state-falls-to-69pct-in-30-yrs_1261812. ^ Thomas Pantham, Vrajendra Raj Mehta, Vrajendra Raj Mehta, (2006). Political Ideas in Modern India: thematic explorations. Sage Publications. ISBN 0-7619-3420-0. http://books.google.com/?id=KJejtAaonsEC&pg=PA48&lpg=PA48&dq=%22Self-respect+movement%22. ^ "Population by Religious communities". Ministry of Home Affairs, Government of India. http://censusindia.gov.in/Census_Data_2001/Census_data_finder/C_Series/Population_by_religious_communities.htm. ^ "Ganesh Chaturthi – Ganpati Festival 2010. Ganesh Chaturthi History". Festivals.tajonline.com. 6 April 2007. http://festivals.tajonline.com/ganesh-chaturthi.php. Retrieved 2010-07-16. ^ "Ceremony of Dahi Handi, Krishna Janmashtami Festival, Dahi Handi Celebrations". Krishnajanmashtami.com. http://www.krishnajanmashtami.com/ceremony-dahi-handi.html. Retrieved 2010-07-16. ^ "दसरा FAQ – All about Dasara in Maharashtra". Sanatanhindudharma.blogspot.com. 6 October 2008. http://sanatanhindudharma.blogspot.com/2008/10/blog-post_06.html. Retrieved 2012-03-17. ^ "Shirdi Sai Baba beats credit crunch to become the 2nd richest temple in the country". http://us.asiancorrespondent.com/Indianomics/2009/01/10/shirdi-sai-baba-beats-credit-crunch-to-become-the-2nd-richest-temple-in-the-country. ^ "Shirdi Sai Baba Temple, Second richest in country ,Rashtrasant Tukdoji Maharaj(Gurudev Nagar,Amravati),Sant Gadge Maharaj(Amravati).". http://news.zakhas.com/2009/01/shirdi-sai-baba-temple-second-richest-in-country/. ^ "2001 Census". Ministry of Home Affairs, GOI. http://www.censusindia.gov.in/Census_Data_2001/Census_Data_Online/Language/Statement3.htm. Retrieved 22 December 2012. ^ Jaishankar Jayaramiah (21 November 2005). "Karnataka caught in ‘language’ web". The Financial express. http://www.financialexpress.com/fe_full_story.php?content_id=109230. Retrieved 2006-11-01. ^ "Maharashtra wants Belgaum be declared a UT". 12 July 2012. http://zeenews.india.com/news/karnataka/maharashtra-wants-belgaum-be-declared-a-ut_787016.html. ^ "Maharashtra Wants Belgaum as UT, K'taka Opposes". OutlookIndia. 12 July 2012. http://news.outlookindia.com/items.aspx?artid=768580. Retrieved 26 August 2012. ^ "Major Cities of Maharashtra". Maharashtraweb.com. http://www.maharashtraweb.com/majorcities.asp. Retrieved 2010-07-16. ^ "11 Indian cities among worlds fastest growing". Timesofindia.indiatimes.com. 23 October 2007. http://timesofindia.indiatimes.com/news/india/11-Indian-cities-among-worlds-fastest-growing/articleshow/2481744.cms. Retrieved 2012-03-17. ^ "Table No 2". Morth.nic.in. 31 March 1996. http://morth.nic.in/writereaddata/sublinkimages/251.html. Retrieved 2010-07-16. ^ "Maharashtra – Physical Infrastructure, Roads". IBEF. November 2011. http://www.ibef.org/download/Maharasthra_271211.pdf. Retrieved 31 March 2012. ^ "Statistics". Mahapwd.com. 31 March 2000. http://www.mahapwd.com/statistics/default.html. Retrieved 2010-07-16. ^ "Maharashtra – Physical Infrastructure, Railways". IBEF. November 2011. http://www.ibef.org/download/Maharasthra_271211.pdf. Retrieved 31 March 2012. ^ "Reliance Airport gets five projects on lease". The Times of India. 6 August 2009. http://articles.timesofindia.indiatimes.com/2009-08-06/india-business/28178331_1_greenfield-airport-reliance-airport-developers-midc. Retrieved 19 September 2011. ^ a b "MIDC projects". Maharashtra Airport Development Company. http://www.madcindia.org/projects.html. Retrieved 31 March 2012. ^ "List of Aerodromes Licensed under Private Category". Directorate General of Civil Aviation (India). http://dgca.nic.in/aerodrome/aero_list.pdf. Retrieved 23 December 2012. ^ "Navi Mumbai International Airport (NMIA)". CIDCO. http://cidcoindia.com/cidco/naviair.as. Retrieved 31 March 2012. ^ "Airport near Rajgurunagar, Pune". Maharashtra Airport Development Company. http://www.madcindia.org/pune.html. Retrieved 31 March 2012. ^ "Maharashtra – Physical Infrastructure, Ports". IBEF. November 2011. http://www.ibef.org/download/Maharasthra_271211.pdf. Retrieved 31 March 2012. This page uses content from the English language Wikipedia. The original content was at Maharashtra. The list of authors can be seen in the page history. As with this Familypedia wiki, the content of Wikipedia is available under the Creative Commons License.